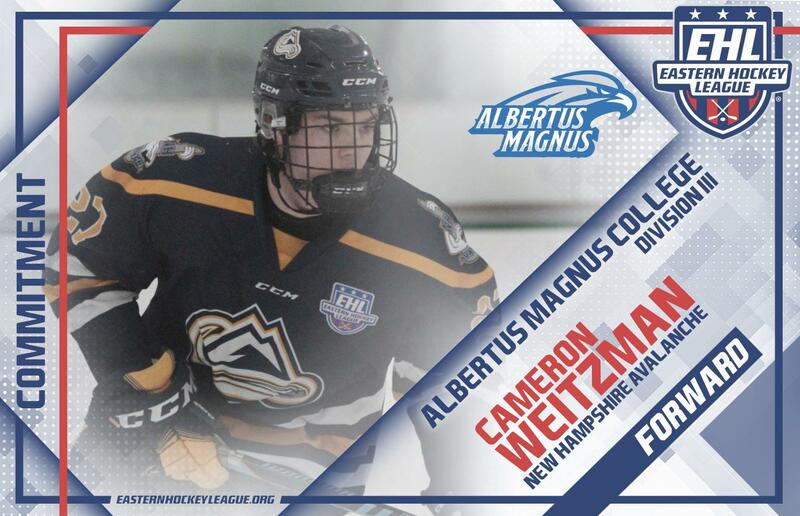 HOOKSETT, NH -- Cameron Weitzman, a forward for the New Hampshire Avalanche, has committed to Albertus Magnus College for the fall of 2019. The '99 native of Canada is in his first season with the Avalanche, and to date, he's tallied 18 points through 20 total games in the Eastern Hockey League (EHL). "I am very excited for Cam; he wanted to get to college hockey after just one season of junior hockey and he was able to do that here with us," said Avalanche head coach and general manager Chris Cerrella. "I think his game has really matured and he is only going to get better as he gets older. I am very happy for Cam and his family and I wish him nothing but the best. He is going to be a good addition to the Albertus Magnus hockey and academic communities. I spoke to Coach Wallack a lot about Cam, and he is very excited that he has chosen to continue his career both on and off the ice at Albertus." When Weitzman arrives on campus this fall, he'll do so with the comfort of already knowing one of his teammates. Thomas Sansone recently made his commitment to the Falcons, as the pair of Avalanche forwards are part of the nine EHL players that are ready to help set the foundation for the new program. This is an aspect of the decision that Weitzman is truly looking forward to. "I am so proud to announce my commitment to further my academic and athletic careers at Albertus Magnus College," said Weitzman. "I want to thank Coach McQuade at Tilton Prep for helping me develop at Prep School last year. I want to thank Coach Cerrella and the New Hampshire Avalanche program for working with me this season, and preparing me for the college hockey level. I want to send a special thank you to my parents for always being there for me and helping make this a reality for me. I am very excited about the opportunity that Coach Wallack and Albertus Magnus College has given me, and I can not wait to be part of something so exciting." Weitzman and the Avalanche have won four of their first five games since returning from the holiday break, and they will look to stay hot this week with matchups against the New England Wolves, the East Coast Wizards, and the Philadelphia Revolution.